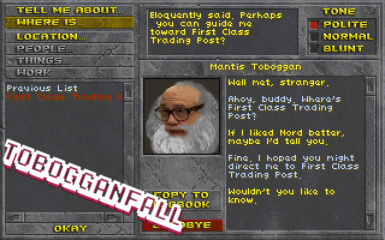 Tobogganfall is a stupid mod I made in 30 minutes when I was first playing around with modding Daggerfall. 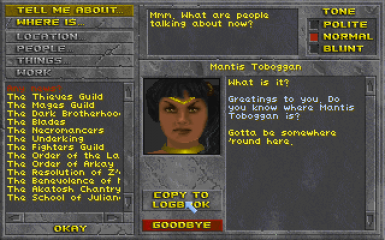 What it does is rename all of the randomly generated NPCs in the game to 'Mantis Toboggan'. 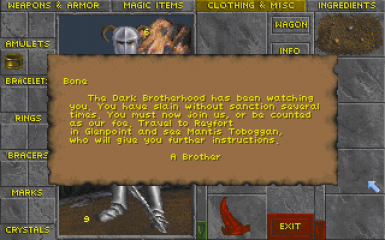 I even got the full name to work with single-name races. It isn't advised that this mod actually be downloaded, it just tarnishes the nexus with it's existence for sentimental reasons, but feel free to install it anyway. "Mantis Toboggan, M.D. was a pseudonym briefly used by Frank Reynolds to capitalize on the failed relationships of Dennis and Mac. While the gang is attempting to break Wade Boggs' alleged beer drinking record on a cross-country flight, Frank gives another passenger a potentially lethal dose of sleeping pills to prevent him from diminishing the on-board beer supply. When the passenger begins to experience severe symptoms, the stewardess calls for a doctor. A drunken Frank approaches claiming to a be a doctor; he introduces himself as "Mantis Toboggan." ("The Gang Beats Boggs")"